Three weeks divine revelation to God’s servant, Pastor Timothy Osemudiamen. 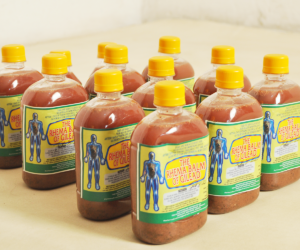 The functions in the body are as follows: Detoxifier/General Body Cleanser, Total healing and Restoration of the Body including: Stroke, Diabetes, Arthritics, Rheumatism, Eyes’ cleansing/Correction, Malaria, Typhoid, Pile, Watery Sperm/Libido, etc. This is not scam but 100% verified and tested. It is also 100% natural without chemical. There is no side effect! Good for both adults and children even one year old baby. The ingredients used by divine formula are: GARLIC, GINGER, LEMON, LIME, MORINGER, PAPAYA LEAF, ALOE VERA, MUSTARD SEED, PURE/UNDILUTED HONEY. Take and enjoy the breeze of full health. Adult: A shot- Morning and Evening. Children: A tablespoonful- Morning and Evening. Stroke Patients: A shot three times daily and applies little quantity on your palm to rub the body. Ehizogie S. Enamiator: Staff-Edo State High Court, Benin City: 08137656527. Munbor Lune: Mace Bearer-Court of Appeal, Benin City: 09031949264. Suzan Edomwande: Casher-Edo State Magistrate court, Benin City: 07057188702. Rita Kadiri: Trader-Ikpoba Hill market, Benin City: 08098432213. Health is wealth; therefore, watch your health becoming healthier and improving daily. Then, you are kindly advised to go for general tests after 7 days. This is never a scam but 100% real. 600m/s bottle is N2, 000:00 only. If interested, call Pastor Timothy Osemudiamen: +234-8051430395; +234-8035196707. Take note: You shall bear the cost of delivery, way bill or transportation. We deliver at your door step. Shalom! Marketers and distributors are needed for wholesale purchase.